More wind power capacity is under construction today than at any time in industry history, the AWEA highlights in its Q1 2014 market report. “The American wind industry continues the construction boom that started 2014, with more than 13,000 megawatts (MW) of wind energy projects under construction at the end of the first quarter,” the industry association states in a news release. The AWEA conference and report are set against a backdrop of heightened market uncertainty, however. In what’s become something of a political “rite of passage,” Congress is once again debating whether or not to renew the wind energy production tax credit (PTC), a key driver of industry growth. The Senate Finance Committee on April 3 sent a package of tax-break extensions, including the renewable electricity PTC, to the full Senate for a vote. Installed U.S. wind power capacity now totals 61,327 MW, with 133 turbines and 214 MW of rated generation capacity having been installed in Q1 2014. That’s more than was installed over the first three quarters of 2013, according to the AWEA’s latest quarterly market report. Wind energy construction is taking place across 21 states across the country. Upon completion, they will generate enough clean, renewable electricity to power the equivalent of approximately 4 million average U.S. homes. Texas leads the way, with over 8,000 MW of rated wind power capacity under construction. Over 1,000 MW of wind energy capacity is being built in Iowa, over 700 MW in Kansas, and over 600 MW in North Dakota. Nearly 500 MW of wind power is under construction in Oklahoma. U.S. utilities have announced the signing of nearly 1,000 MW-worth of new wind power purchase agreements (PPAs) so far in 2014. Wind PPAs totaling some 8,000 MW were signed in 2013. 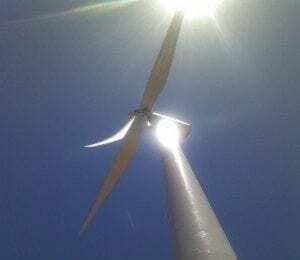 Construction of wind power projects representing approximately 5,000 MW of them have not started construction, which should continue to buoy wind energy-related construction activity over the course of the year. AWEA CEO Tom Kiernan noted the sharp reduction in the cost of wind power that has taken place in recent years, which has been driving the cost of wind power lower than that for coal and natural gas-fired power plants across a growing swath of the country. Among the high-profile corporate investors and purchasers of wind power are Google, which signed a contract for up to 407 MW of wind power from MidAmerican Energy’s Wind VIII projects in Iowa, and Ikea, which made its first wind farm investment by purchasing Apex Clean Energy’s Hoopeston Wind project, which is being built in Illinois. Despite the unprecedented achievements and realized benefits of the past 15 years, the wind energy growth outlook for 2014 and beyond is highly uncertain. Key to determining a future growth path, a bill that includes extending the wind energy PTC, which has been in effect since the renewable electricity PTC was last extended as part of the “American Recovery & Reinvestment Act of 2009” (ARRA), is up for a vote in the Senate. 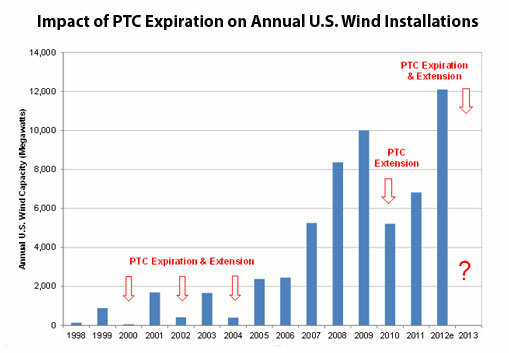 Congress has allowed the wind energy PTC to expire five times since it was first instituted back in 1998, most recently on December 31, 2013. 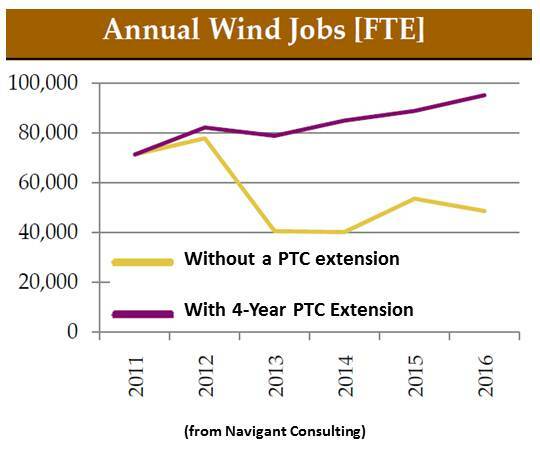 Wind energy investment and construction plummeted in the year following each expiration, which led to commensurate drops in wind energy industry employment. 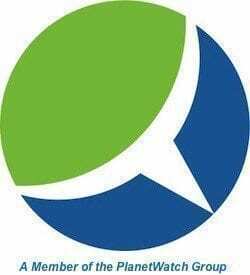 “This year’s conference will not only highlight the ‘now’ of wind energy, we’ll also hear from DOE about progress on its Wind Vision report of how U.S. wind energy can double by 2020 and grow to meet 20 percent of U.S. electricity demand by 2030.